Winter’s Graces began as a whisper more than fifteen years ago, a pst! so faint at first that it barely registered in my awareness. The whispering continued, sensed with what St. Augustine called “the ears of the heart,” rather than those on the sides of my head. Each pst! arose in the midst of a seemingly ordinary activity: walking in the woods, having a conversation, or reading a book. A more detailed version of this story appears in the introduction to Winter’s Graces (“An Accidental Crone and the Birth of a Book”), but the short one is that it took almost four years to make out what the whispering was saying – write a book about the winter of life and its surprising gifts – and another twelve to do its bidding. The mission was not a welcome one at first. I was only 54 when the first pst! occurred and didn’t think I was a very suitable person for the job. But despite my hesitation (and outright rebellion at times) this task has taken hold of me, inspired, and stretched me, and over time has enhanced my view of aging – and my life – profoundly. I began the project as a woman in midlife, looking into the distance, wanting to learn about the winter of life from elders themselves, from science, folklore, film, and other sources. I realize now – just shy of 72 – that I’ve needed all these years to grow into what I was learning about age. I’m a youngish old woman by today’s standards, but an old woman all the same, grateful for my years and my oldness. 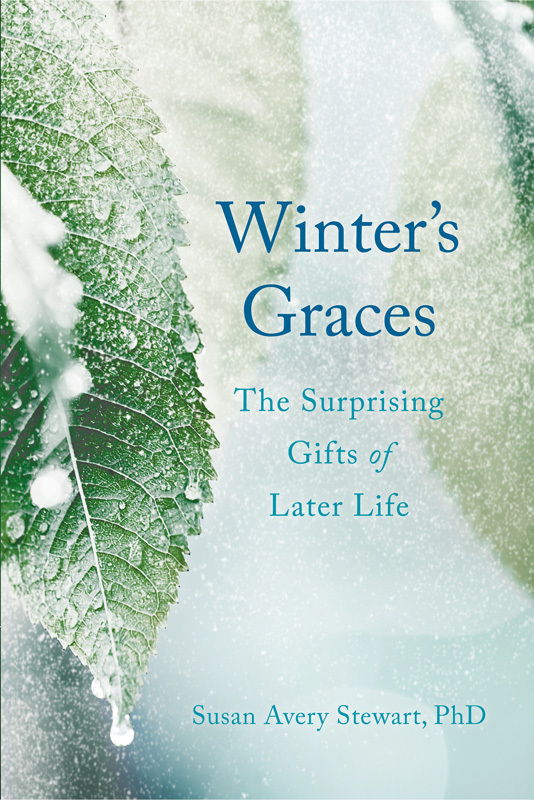 Winter’s Graces: The Surprising Gifts of Later Life has been a long and arduous, ultimately joyful labor of love that would not have occurred without the support and assistance of friends, coaches, and midwives at various points in its gestation and birthing. Their names are gratefully included in the Acknowledgements at the end of the book.